At the start of September I decided to try a seven minute workout once a day and tracked my progress over the month. Here’s my honest review of the routine and the apps I used to develop the exercise habit. What is the Seven Minute Workout? 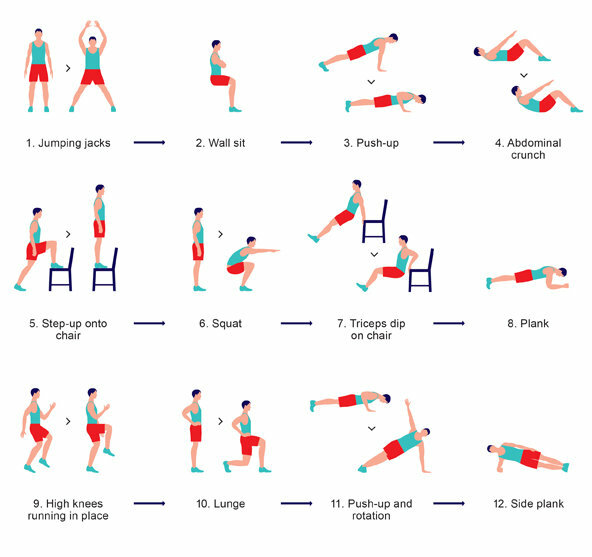 The Seven Minute Workout was popularised by a 2013 article in the New York Times written by Gretchen Reynolds. The article drew on a study published in the American College of Sports Medicine’s Health & Fitness Journal. It’s worth noting that, while the research states you can benefit from just 4 minutes of this workout and one full circuit takes about 7 minutes, the authors recommend at least 20 minutes of HIIT. To get myself started, I’ve just been doing a single set every day for about a month. Thanks to the Seven Minute Workout’s popularity, plenty of smartphone apps exist to help you follow the routine. They vary from sought to polished, independent to corporate. There are plenty of features in the app I don’t use, including ‘smart’ routines based on your likes and fitness level, exercises beyond the 12 standards and some social media sharing. As you use the app, it occasionally sends you articles designed to teach you a little about health, fitness and nutrition. These work well and manage to be just the right side of snappy after a tough workout. As well as the training app, I used my favourite habit tracker Momentum to record every workout I completed over the month. I think you can see some progress, which isn’t bad for only seven minutes per day. My fat mass also dropped slightly from 16% to 15.8%. The best thing about this routine is, unsurprisingly, the duration of the workouts. At just seven minutes, it’s easy to fit a session into your day. For the most part, I scheduled mine between putting the kids to bed and making dinner for the night, but where I felt too tired I just squeezed it in before bed. It’s reassuring to know that as long as you start by 11:53pm, you can still tick off another day. The routine itself, provided you go at it hard enough, leaves you with a post-gym feeling of tight muscles and I tended to feel it in my legs the next day. After just two weeks I noticed myself feeling healthy and standing taller, walking around at work I feel stronger and sturdier than I have since I used to regularly go to the gym. I recommend this routine to anyone who wants to get a bit healthier but doesn’t want a gym membership or massive time commitment. There’s no equipment needed, no cost and it takes less than ten minutes of your day. Next up, I’m going to cut the weekly target to five days and not seven and I’m going to change this habit from one-off experiment into a lifestyle choice.